How to customize product grid view? How to edit product data right on the product grid? How to keep track of product inventory? Want to reduce time spent on product data processing and edit all necessary attributes right on the grid? Due to the Extended Product Grid with Editor, you'll be able to fine-tune grid display according to your needs. With Magento 2 grid filter option, you can filter products by category and create custom grid view templates to ensure prompt access to any product information you need. Expand the default Magento 2 product grid with additional attribute-based columns and easily modify them. The extension offers an easily customizable grid. Drag-and-drop columns with cursor and sort them in the order which is the most suitable for you. With the custom template option each store administrator can configure enhanced Magento 2 product grid according to his/her individual needs. It's possible to add any extra columns to the standard grid and save it as a separate template. Add any product attributes of the following types to the Magento 2 admin grid and display necessary data in additional columns. Easily filter your grid data by any parameters you need. With the module you can customize filters block by adding and removing any columns or attributes. 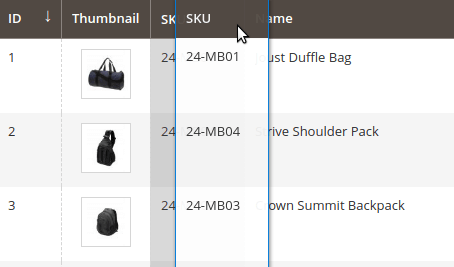 Flexible extension settings allow you to add cross-sells, up-sells and related items to the product grid to keep all information about products at hand. With the advanced grid tool you can show product categories on the grid. Once you enable categories column, the corresponding Magento 2 admin grid custom filter is added to the default filter settings to let you sort products by category. You can easily disable any default product grid columns like 'Attribute Set', 'Status', 'Thumbnail' etc. and switch them on again at any time. Show columns with the date of product creation as well as the date of latest product modification to easily find out when each particular item was edited last time. Due to the category display option you can also identify products which are not assigned to any category. This will help you to timely fix any category-related issues and keep all products in relevant categories. The Magento 2 grid customization module enables you to create custom grid view templates with different column sets and switch from one template to another right on the grid. This handy option will help you accurately fine tune the grid view according to specific needs of each admin user. With the handy Magento 2 enhanced product grid tool you can configure the majority of product attributes right on the grid. It means there is no more need to open the corresponding product info page each time you need to make a small correction. Simply add all necessary columns and edit product data right from the grid. Easily configure product name, SKU, description, price, quantity and many other attributes. To help you avoid making mistakes while configuring product information we've developed a special validation feature. It works when you leave any cell empty or, for example, specify numbers instead of letters. The product grid Magento 2 module won't save wrong information and will highlight the field with inaccurate data. The enhanced grid Magento 2 extension enables you to save edits either one by one or in bulk. Choose 'one by one' mode to save each correction right after it's been made. The 'bulk mode' enables you to make all corrections you need and save them all at once. This editing mode is useful when you need to edit large volumes of information, while 'single saving' is great for editing one or two grid cells. With the module admin users can add a column with frontend links to the grid to easily check out all changes they make. Now you don't have to manually open the corresponding frontend page each time you make a correction in the admin panel. Simply save the data and click on the direct link to view the changes on the frontend. When you receive a new batch of products you can edit and calculate their quantity right on the grid. All you need to do is just to add the number of arrived items to the ones you have in stock. For instance, you've got 100 products A in stock and have received 250 more products, so enter 100+250 in the corresponding quantity field and the enhanced grid Magento 2 extension will automatically make necessary calculations. You can also deduct product quantity in the same way. Enable this option if you want the stock status to be changed automatically depending on product's quantity. The Magento 2 admin product grid will show 'in stock' status for products with positive quantity and 'out of stock' for items with zero or negative quantity. With the new 'Qty Sold' column on the product grid you can see how many products were sold. 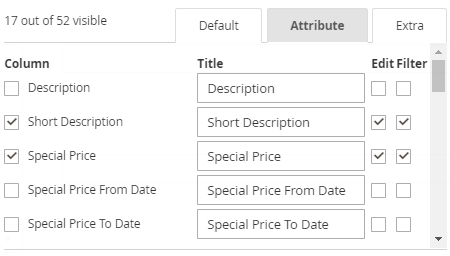 On top of that, you can set conditions to display the sold quantity for the specific period and take a look at your business from a new angle. As extended and flexible as your admin product grid is with the above-described extension, let your web store appear to your customers on the frontend with Magento 2 filter products by attribute. We created five custom grid templates – one for each store admin. Btw now the grid can also show tier prices. That's a nice feature for those who use a customer bonus system. I guess it’s not mentioned in the description. Overall, the module does extend product management ootb. I customized the grid to simplify my admins work. Editing on-the-go saves lots of time while updating the catalog. We had some problems w/t search by category; yet amasty fixed the issue fast. We had this extension on our previous M1 site and it was one of the must-haves when we upgraded to M2. This extension adds the critical "Categories" information to the catalog product grid and filters and also makes bulk editing products directly from the product grid possible. This saves us literally weeks of time in product creation and editing. Love the new product grid customization features in M2 version plus being able to save different grid layouts for quick access when needed. The module is not bad, but I hope they'll make it more flexible in the nearest future. Anyway, this a high-quality tool that really helps manage items without opening new tabs for each item you edit. Everything works as described, besides the support answers very fast. – Improvement: we improved the inline edit action on the grid regarding tags usage. No tags will be added to the field if an attribute is been set up not to use tags. – Added in filter option to show all items without category. – Added possibility to display Tier Price on grid. – Added possibility to sort grid columns by update date and creation date.